VMware Workstation 6.5 is slick, powerful and the most fully featured of these suites, boasting USB support and DirectX 9.0c rendering. On top of that, Unity enables you to interact with the client's apps as if they were running natively. It's also the only platform that installed all three operating systems without a hiccup. VMware Workstation is, however, the most expensive app by some way and as such is out of the reach of most consumers. Don't be too put off by this, though, as there's a 30-day trial that could be the perfect solution when combined with the free VMware Player. This is a cut-down version of the app that can't create virtual machines, but it can run any of them. This means you could set up your virtual machine using the trial, and then run them using the free player. 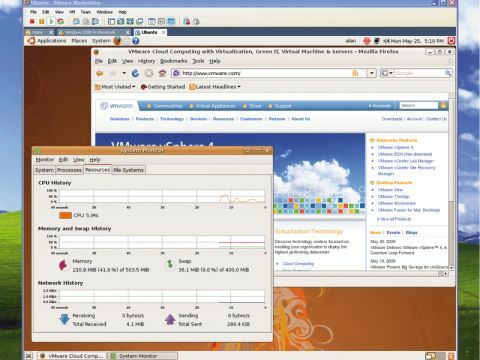 There are plenty of virtual machines on VMware's website too, covering plenty of Linux distributions as well as firewalls and similar tools.